At the Frederick W Hill Mall, Regina, a bison sculpture sits between two towering high rise buildings. 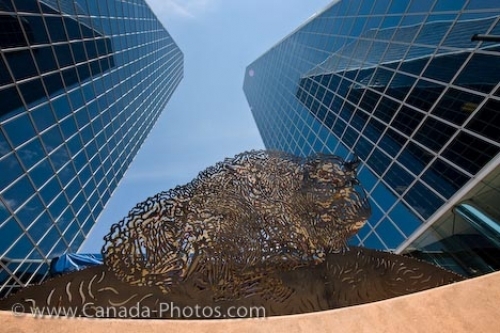 In the city of Regina, a bison sculpture and two high rise buildings are at the Frederick W Hill Mall. The sculpture is a bison laying in a field. The two high rise buildings tower over the sculpture. Glass mirrors from the buildings reflect each other. High rise building towers and bison sculpture in the Frederick W Hill Mall, in the City of Regina, Saskatchewan, Canada. A sculpture of a bison at the Frederick W Hill Mall, Regina, Sskatchewan.